Receive book updates, free snippets, discounts and more! Click through now to get your copy of Don't Think of the Black Cat. What is Don't Think of the Black Cat? 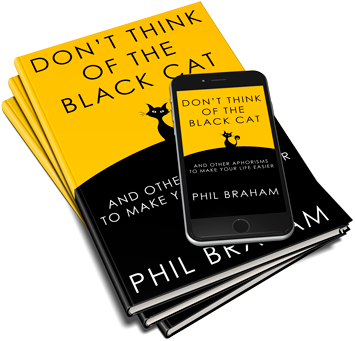 Don't Think of the Black Cat is a collection of insightful aphorisms by renowned Australian author and hypnotherapist, Phil Braham. This book gives you years of hard-earned, well-tested wisdom in useful, bite-sized chunks. The aphorisms are easy to remember - though some may take time to digest - and they are offered as practical advice to be implemented in your life. Read and understood in the right time and place, these aphorisms could be better than a year of therapy. Men and women of all ages can benefit from the advice contained in Don't Think of the Black Cat. Memorable aphorisms with useful explanations to help you navigate life's tricky spots and achieve success. Years of study and practice in spirituality and counselling are distilled into the aphorisms in this book. More than just ideas to think about, this book gives actionable advice which you can immediately implement to make your life easier. Sometimes we can become trapped in a limiting world view without even realising it. This book will help you question your assumptions and see things in a new light. We are social beings and the quality of our relationships largely determines the quality of our life. Get advice on building and maintaining happy relationships of all kinds. By applying the life tips in Don't Think of the Black Cat you will discover a natural confidence to flow more easily and achieve success in ways important to you. I've made these tips a part of my personal development to become the best version of myself. Every week I focus on a new tip and experiment with it to see how it works. So far, the results have been amazing. My relationship with my wife and kids has improved, my work situation is 1000% better (a boss that had been taking advantage of me now knows my boundaries!) and I just feel more calm in general. This book has given me the tools to change my life, it's the best thing I have on my Kindle. At first I skimmed through the book and thought, "oh yeah, just another self help book," but one day when I was overwhelmed I found myself reflecting on the very first piece of advice - to take a snapshot of how busy my mind is - and I immediately understood the source of my difficulty. I realise now that these aphorisms and their explanations can be as deep and as helpful as you want them to be. I can see the spiritual influence on Phil Braham's work and now I'm slowing down to appreciate this book properly. So much common-sense - love it! Do you still do hypnotherapy consultations? Where are you and when can I see you?! So much common-sense - love it! Do you still work as a hypnotherapist? Where are you located and when can I come to see you?! The more you think about not doing something, the more you are thinking about doing it. Will power for stopping a habit rarely works. This is why people find it so difficult to stop smoking ‘cold turkey’. They concentrate on the feeling of smoking or they can imagine themselves smoking. It’s as if their mind is on a collision course: the more they think about not smoking, the more they think about smoking, and usually they will find that the thoughts of smoking become so powerful that they pick up a cigarette. If I said to you: “Whatever you do, don’t think about the black cat in front of you”, you would find yourself thinking of the black cat. This applies to most habits. The secret is to realise that you can acknowledge the thought of the habit and simply let it pass. You don’t always have to explain yourself. Research has found that the unconscious mind learns patterns before we become conscious of them. This sometimes results in what we call a ‘hunch’. We ‘get a feeling’ about a person or that something is wrong. We are not logical. If you get a hunch, go with it. You may be wrong and in time you may learn to distinguish between correct hunches and those that were simply flights of fancy, but if you attempt to only take action when you can explain why you do what you do, you can become fixed in your ideas and cut yourself off from the wisdom inherent in your unconscious mind. There’s a saying that you can’t teach an old dog new tricks. This is incorrect. Not only can you teach old dogs new tricks but old people can, and should, learn new skills. I’ve heard thirty-year-olds talking about how they are looking forward to their retirement, and I’ve known sixty-year-olds who have trained in new professions. Not only is it true that you are never too old to learn, but it’s also true that you are as old as you feel, or rather, you are as old as your thinking patterns make you. Some people become fixed in their thinking at eighteen and develop the mentality more suitable to an old person; other people retain a flexibility in their thinking until they die at an old age. Learning new skills grows new neural pathways in the brain and develops a flexibility in thinking.